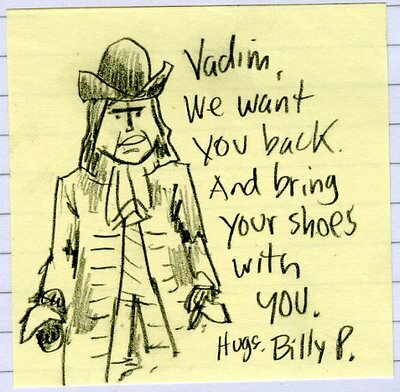 Vadim said… can you do a Philly doodle for a boy who misses home? Back in one of the old jobs, I spent a good part of 3 years or so looking at the bottom of Vadim’s shoes while he had his feet up on his rolling file drawers and wrote code, did trouble-shooting, and generally tried to make me go away. He had good shoe style. Now he’s a west coaster doing his thing and I have yet to meet his match in shoes or technical savvy (or argumentativeness). 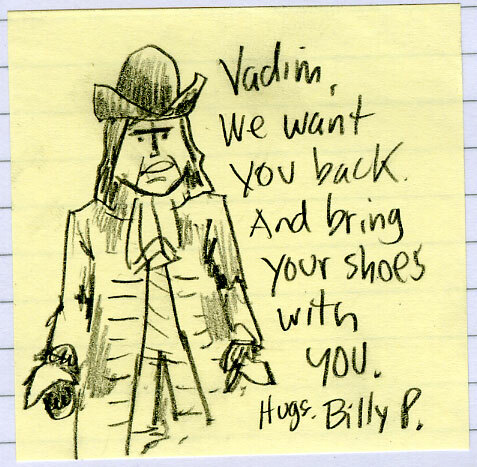 This entry was posted in doodles, philly, requests, shoes, vadim, williampenn. Bookmark the permalink.